One of the many things that fascinate me about Europe is it's churches. Being the seat of the Roman empire and Christianity, the old churches are just so awesomely grand that I can't resist visiting them. 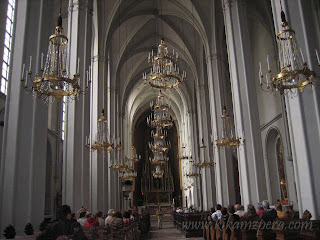 When we were in Vienna, Austria we didn't get to explore all the churches but I was content to visit the Augustiner Kirche (Augustinian Church) which is just located in the Hofburg complex. What makes this church so special? The beautiful Gothic interior of Augustiner Kirche. The tomb of Maria Christina. 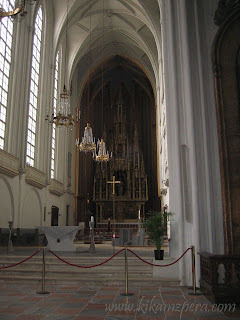 Aside from its well-preserved 14th Century Gothic interiors, this former parish church of the Habsburgs also houses the 18th-century tomb of Princess Maria Christina, the favorite daughter of Maria Theresa. 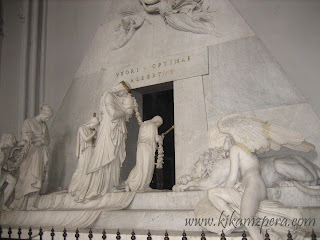 The ornately decorated tomb shows the Princess and her family entering the tomb and is an Antonio Canova masterpiece. The tomb, however, was never used because the princess was buried in the Imperial Crypt. 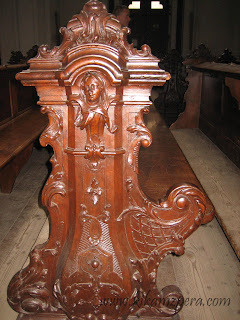 Ornate wood carvings on the church seats. The Sunday masses of June to September are also special because the music of Haydn or Mozart are featured in a spectacular organ mass. Sadly though, we visited on a weekday so we didn't get to experience hearing mass with Mozart or Haydn's music. It must be an amazing and moving experience!